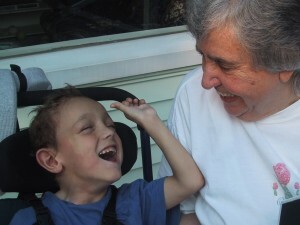 My child was born with severe, chronic, multiple disabilities. Our path was not so much about fixing his problems as it was about ‘maximizing his potential’ and ‘harnessing his natural abilities’. A modern and enlightened approach certainly, especially when compared to the mindset of previous decades. But let’s be real: even with this generous perspective, Owen was still charted against typical, age-appropriate development and until the golden day when he would catch up with his peers (lol!) we would be doomed encouraged to continue his ongoing intensive treatments and therapies. While no longer overtly stated and now wrapped in a rather cheerful bow, the ‘not good enough’ was implicit. Families with a child with disabilities willingly sacrifice these things and our institutions expect us to as well. Of course no one comes out and says we must intentionally trade this for that, but when it inevitably happens we get sympathetic looks and reassurance that we’re doing the right thing. Parents have a very hard time recalibrating their hopes and dreams for their children, as well as their own definition of what it means to be a good parent. Parents are fearful. It’s an increasingly hostile world for adults with disabilities, especially those with severe disabilities. Social isolation, institutionalization, poverty – the outlook is generally bleak. In fact, some find this so bleak that they see mercy killing and growth attenuation therapy as justifiable options, carried out without consent of the person in question and for which otherwise reasonable people (and in the case of growth attenuation, medical ethics boards) can find empathy. Because we can. Medical technology keeps pace with our fears and sometimes takes the lead, telling us what to fix by virtue of its mere existence. * I intentionally leave out the motivation that starts with “Because every parent wants what’s best for their child” – this is covered by the first point. And probably the second point. Oh and maybe the third and fourth. Also, I appreciate that the desire to relieve actual physical pain is a motivation as well, but I prefer to stay away from the subjective and slippery ‘suffering’ attribution. Disability, even severe, does not necessarily mean suffering. I don’t for one second advocate for removing therapies for young children on principle–but I do wonder why there isn’t more inquiry on all sides, pondering the hard questions earlier on. Questions like, will it be worth it? What is it we’re really trying to make the child do, and why? What would my child likely want? Ought I trade my child’s childhood and my family’s remaining normalcy for what will likely be minimal improvements over a very long stretch of time? But of course, hypothetical questions can only get hypothetical answers. If I ruled the world? More families and parents would tell their stories. And those stories would be openly accessible to all who can learn from them–doctors, clinicians, researchers, families and the patients themselves. We need to properly close the feedback loop instead of letting only medicine and healthcare provide partial answers. Have you ever met a deaf person? Hey @Louise! The beauty of narratives is they don’t preach. But they can change how someone sees things if they are open. Our niggling doubts tend to be ignored or squashed through the healthcare journey. Perhaps stories (which families can relate to) will broaden perspectives, giving parents a hope of making decisions they can live with long term. Imagine if you had read 10 stories of families who followed one path and 10 stories of families who followed another. I am quite sure if I had, I would have found balance earlier. Interesting this, after being at the Canadian Down Syndrome Society Conference (in Toronto!) where we (Canada, the CDSS) are looked up to world wide for the statement that we embrace DS as just a naturally occuring variation contributing to the diversity of the human rac–i.e. not something to be fixed. The statement (I just looked it up) reads “Down syndrome is a naturally occurring chromosomal arrangement that has always been a part of the human condition. The occurrence of Down syndrome is universal across racial and gender lines, and it is estimated to be present in approximately one in 800 births in Canada. Early on we certainly traded therapy for friends, hopscotch, sidewalk chalk. Early on we were lucky to be mentored by those fighting for inclusion, which put a different spin on things, whatever your opinion about inclusion. Because inclusion, at its root, focuses on community, diversity, and belonging. Maybe tho, it might have been different if we had major medical issues. I don’t know. I love the definition – gives a solid counter-perspective (to the norm) without being sappy. Ooops. Also, I think blogs like this one and others where people do get to tell their stories, open up worlds! These were not available during our early years of parenting. At the CDSS conference (just mentioned) we heard 2 stories, told by self advocates and their families, about moving out into their own apartments. One was very planned, long term goal, other was willy nilly, lets see if this works and then lets regroup. Helped me see that there was no RIGHT way, only many ways and you find what fits. These stories are invaluable! Thanks for your comment Nancy… I agree, at the very least stories show us there is more than one way to go about something. I’m curious: what did you mean by ooops? Just that I hit the post button before I finished! 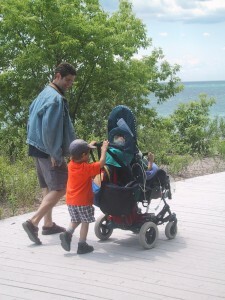 My husband and I knew even before Andrew was discharged from the NICU–despite what the optimistic therapists and NICU doctors told us about the miracles of therapy and how “you never know with the brain”–that Andrew’s brain damage was on the very, very severe side. Between the brain scans of what was left of his brain, the neurological red flags everywhere we noticed while in the NICU, and my husband being a neurologist, we just knew. I felt like I knew too much and my hope was dashed and I knew that to survive, I needed to just accept that Andrew will likely never walk, talk, see, hear well, eat by mouth, etc. So while Andrew still receives 11 therapy sessions a week and I see very little difference from when he started two years ago, I appreciate it in that it at least stimulates him and he enjoys it. Otherwise, even though he is young, my focus is solely on keeping him happy, comfortable, and enjoying life… not always the easiest feat! That’s all I really care about, period, NOT *fixing* him. And, Jennifer, while knowing too much about the brain to some degree has helped, I would never have arrived (still working on total arrival) at this peaceful place without blogs like yours, without stories like Owen’s. So thank you!!! Thanks for your encouragement and of course your own unfolding story! I also gain so much from continuing to read others stories – 19 months tomorrow since Owen’s death and I’m still just sorting out his (our) life. Jen, this is probably one of my favourite blog entries to read. I was so engrossed that someone had to yell at me about five times to get my attention. I also am very aware of all the things that you talk about, mother-child relationship, giving each child enough attention, a mother relishing her young child’s joys and living within their means. I do as much as I can to help a family have all these things. The budget thing is a little hard for me, but I do provide new families with all their options before they decide. By the time I meet a family and their child, the child may be three and up. Sometimes this happens because parents don’t think they’ll need help or don’t know it’s out there. Usually, the things that young parents tell me they have been told they have to do by professionals ‘to be a good parent’ is astounding. It is a long list, that days don’t leave time enough to finish. Parents are always playing catch up! I hope I relieve that somewhat, but I know that I go home at some point. I don’t mind doing light house cleaning, as long as it doesn’t take away from the child and they enjoy it. I don’t know what more I can say, but I really appreciate your blog and what you’ve said here. I am still learning and have a far way to go. I am still, one by one, changing the idea of disability in the community and what ‘respite’ really means and making it something for both parent and child to look forward to. Thanks for your comments @Marjorie! I have no doubt that your assistance and perspective is deeply appreciated, even if the families are too overwhelmed to say so :) I always loved your ease and matter-of-factness – reminded me that things are what they are, and should be enjoyed.